Then choose seat and start reading your lines. The Autocue app is variation of the "Meet Your Stranger" concept, an instant do-it-yourself theatrical experience which can occur whenever two people (with smartphones) meet. The original concept was developed by Sander Veenhof, Andre Freyssen en Madeleen Bloemendaal and launched at the International Film Festival Rotterdam in 2011. Variations of the concept have been presented at various other events and occasions. The Autocue version of Meet Your Stranger was created Autonie #5, the final edition of a series of events exploring and reflecting on the future of mobility in relation to the Binckhorst are in The Hague, The Netherlands. The cooperation between augmented reality expert Sander Veenhof and designer Victor de Vries leads to playfull hands-on research into the future of the digitally empowered human. They hope to inspire audiences and creators to look beyond the obvious, logical and functional use-cases. The fact that we live in a semi-digital world, does not mean we have to live with a digital mindset, judging everything by the amount of megapixels and its usefullness. In their projects they connect people through hardware and software, but without losing the human touch. By making use of the hardware in everyone's pocket they turn any location in the world into a miniature stage for immersive experiences. Obviously, AR is their preferred way to bring people together in space and time. Instructions: to experience Autocue you need at least two people, and a car. By selecting your seat, you're assigned a role. You'll be part of a classic car scene of a movie you'll probably know. A number of movie scenes runs in autocue mode as an infinite loop. You and other people can join in and out at any time. Read aloud your lines when you're instructed to do so. Or listen to one of your fellow passengers. 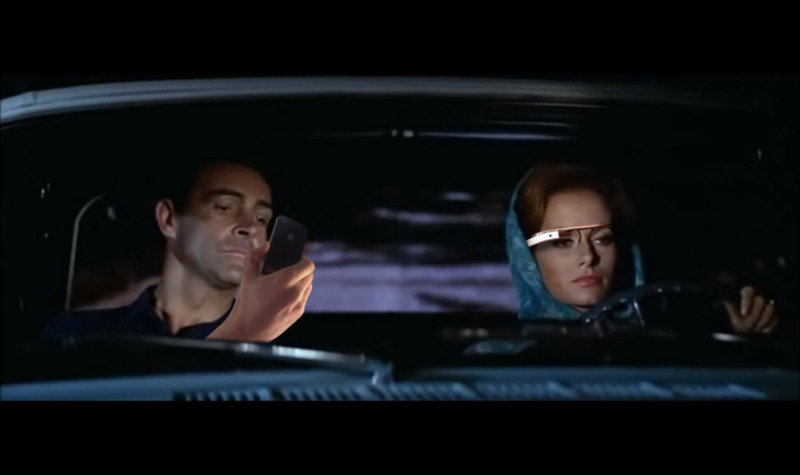 If you're the lucky owner of a Google Glass, please wear it if you're joining an Autocue experience while driving the car. Click the menu to download the Glass app. The Autocue system was created for the one day event "Autonie #5", but it was decided that it deserved a longer lifecycle. Excuse us for any bugs and inconveniences that might occur on devices we haven't thoroughly tested yet, fixing some issues is a work in progress. If you feel like sharing your feedback, or if you see opportunities to use a bug-free and perfected version at your event or occasion, get in touch. We can work on that!